Judge Brett Kavanaugh is going to be a weeks-long torment for some on the Hill—and I’m talking about red state Democrats. Senate Republican moderates Susan Collins and Lisa Murkowski have been very receptive to Kavanaugh’s nomination, easing pressure from the right that they could sink this SCOTUS nominee if they defect. That could be the case, but for now, pressure has ramped up on Sens. Jon Tester (D-MT), Heidi Heitkamp (D-ND), Joe Manchin (D-WV), Joe Donnelly (D-IN), and maybe Bill Nelson (D-FL). Nelson needs help. Republican Gov. Rick Scott is outworking him on Hispanic outreach, and he’s beating Nelson with older voters who are more likely to turnout in November. A vote for Trump’s nominee could boost his chances of eking out a win—and that goes for the rest of the bunch. The downside is that they’ll be persona non grata in the party. The national party could ostracize them, freezing them out on much needed help on voter outreach, grassroots work, etc. if they vote for Trump’s nominee, especially when they think Roe v. Wade is going to be overturned. Then again, in the nightmare scenario, the GOP could pick-up all of these seats. 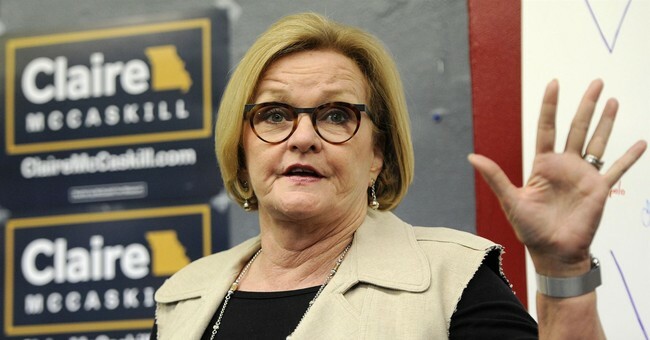 Sen. Claire McCaskill (D-Mo.) kept her cellphone glued to her ear whenever she walked through public hallways, making it impossible for journalists to ask her about Kavanaugh’s record. Sen. Heidi Heitkamp (D-N.D.) bolted from the Capitol out of the first floor exit instead of taking the Senate subway, where most reporters camp out. Senate Democrats admitted it will be difficult to defeat Kavanaugh with only 49 seats in their caucus, but their goal is to inflict as much political damage on the GOP as possible ahead of the November midterm elections. “We have to lower the expectations of our base. We can’t defeat the nominee on our own,” said a Democratic senator who requested anonymity to discuss internal party deliberations. We’ll it’s the only thing they’ve got, but I’m confident that the damage will be minimal. Will the Left be energized? Yes, but so will Republicans, who turnout in greater numbers in off years. The notion that Democrats could destroy the agenda that’s created a booming economy, record low unemployment, and record high scores in consumer and small business confidence will get the GOP to the polls. The conservative appointments to the court will as well. Also, the pervasive criticism and overreactions from Democrats and their allies in the media have forced Trump skeptics Republicans within the GOP to defend him. As we draw closer to Election Day, it’s no secret why McConnell wants to have a final vote on Kavanaugh by early October. It does place the Democrats in a jam. Money spent against the GOP could be diverted towards their own members to remind them what’s at stake. There is no relief in this situation. They’re all backed into the corner.